I bought The Silent Hours a few weeks back, but I hadn’t gotten around to reading it yet, when this book arrived through my letter box. As I hadn’t read anything by Cesca Major before, I didn’t know what to expect. I knew that it was Historical Fiction, yes, but that was all I knew. I wasn’t expecting it to pull at my heartstrings quite the way it did. My heart broke a little more, when I read the authors note at the end of the book and found out that it was a true story. 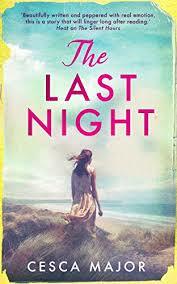 The Last Night tells the story of two different women, decades apart, which were inspired by true events, as I have already mentioned. Irina, has her fair share of secrets. She has pushed away those closest to her, finding herself single, Irina spends her days a furniture restorer. She sees each new project as a challenge, but when a bureau arrives for restoration, it brings with it many secret of the past, that haunt Irina and send her on the journey of a lifetime, while she tries to figure out why the bureau holds such a significance to her. Rewind to 1952, and we meet Abigail, who is devastated after the sudden and unexpected death of her beloved mother. With nowhere else to go, Abi is forced to move to a strange town and in with her sister and her sister's husband. Abi hasn't seen her sister in quite some time, and even though the two were close when they were younger, now they seem like strangers. 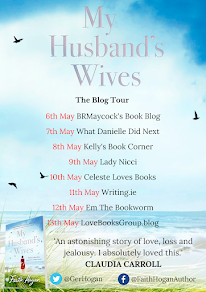 Surprised by the luxurious lifestyle that her sister lives, Abi starts to settle in well, but soon she realises that her sister's husband isn't all he's cracked up to be. Shocked by his actions, Abi plans to get away, but then disaster strikes the little seaside town and nothing will ever be the same for the residents of the town again. I adored this book from start to finish. I love how it has a real air of mystery to it, especially in the form of the ghostly goings-on in relation to the bureau. We are also left guessing when it comes to Irina's past. We know that she is left with a scar on her face as a result of an accident as a child, but we are left guessing as to what the accident and what effect it has had on her life. As the story progresses and more and more pieces of the puzzle are put together, my heart began to break for Irina and all she has been through. The ghostly incidents involving the bureau are extremely compelling and really keep the reader on the edge of their seat throughout the book. The characters are so brilliantly written and very well developed. Both Abi and Irina are extremely likeable characters and I wanted nothing but the best for them throughout the book. Upon reading the end note at the end of the book and discovering that this story is based around true events, I was very glad that Cesca Major decided to write this story and to give that woman a name, so to speak. The Last Night is full of twists and turns around every corner, with each chapter brings even more suspense and mystery to the story. I couldn't put this book down. Once I had started reading the story, I was quickly swept up and into the pages of the book, living every moment with the fantastic characters. Cesca Major has written an absolutely spellbind and breathtaking book, with some of the most beautiful imaginary that I have the pleasure to read. A very talented author, who has mastered the art of storytelling perfectly. I can't wait to discover more from this brilliant author.